AURORA, Ill. — Exercise science isn’t something undergraduates can learn just sitting in a classroom. It requires hours of applied, hands-on experience, not to mention familiarity with today’s state-of-the-art anthropometric and metabolic equipment. And it doesn’t hurt for students who are going on to graduate school to have had some real research experience under their belts, either. 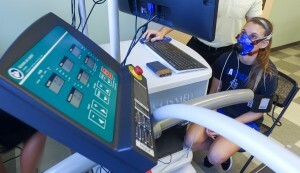 Aurora University’s year-old bachelor’s degree program in exercise science fulfills all of these demands, according to Chris Pitsikoulis, assistant professor in the university’s School of Education and Human Performance. “The AU exercise science program is unique in that it provides the whole package: theory, practice and outstanding facilities, all of which complement one another and enhance the learning experience,” he said. State-of-the-art equipment, research opportunities and hands-on experience are all part of the exercise science program at Aurora University. AU began offering the exercise science degree in fall of 2016. During its first year, the program enrolled 63 students in three areas of concentration, including sports performance, fitness and wellness promotion, and pre-professional studies, which prepares students for graduate work in physical therapy. Pitsikoulis attributes the exercise science program’s popularity in part to the number of AU students who participate in sports. The university fields 24 NCAA Div. III varsity teams — men’s and women’s — and on average about 20 percent of the entire undergraduate student body plays on one of these teams each year. “Sport has been such a key part of these student-athletes’ lives that they want to continue to be involved in physical fitness as a career,” he said. 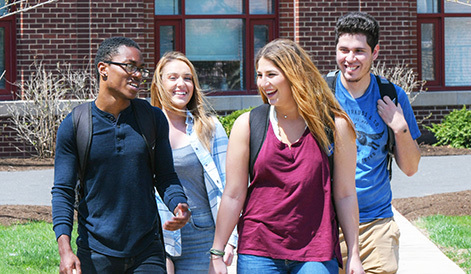 Particularly popular is the pre-professional studies concentration, a highly structured program specifically designed to provide students the prerequisites necessary to be accepted into graduate Doctor of Physical Therapy programs. The DPT is required for physical therapists to practice professionally. Nationwide, demand for qualified physical therapists is expected to grow an extraordinary 34 percent between 2014 and 2024, according to the Bureau of Labor Statistic’s 2015-2016 Occupational Outlook Handbook — and with a median income of more than $80,000 per year, it’s no wonder. Students in the fitness and wellness promotion concentration work in a variety of occupations, from personal training and health education to cardiac rehab and corporate fitness facilities, anywhere where motivational, often individually tailored fitness programs are called for, such as hospitals and fitness centers. Students who plan to work more directly with athletes choose sport performance, where a big focus is on strength and conditioning training. Upon graduating, these students are prepared to successfully complete the Certified Strength and Conditioning Specialist exam that is offered through the National Strength and Conditioning Association (NSCA). Sport performance students — like those in the fitness and wellness promotion and pre-professional concentrations — often work with AU athletic teams. He noted that exercise science students also assist in conducting faculty-sponsored research projects, often joining professors to present their findings at industry conferences. Every other year during AU’s three-week May Term, faculty members lead groups of exercise science students to Colorado to visit training centers for the U.S. Olympic team and the U.S. Air Force, as well as NSCA headquarters. In their senior year, each student is required to complete an internship — practicums for pre-professional majors. “We work with students to place them in locations that most closely aligns with their career ambitions,” Pitsikoulis explains. Such placements can lead to post-graduation job offers and help graduates establish professional networks in their fields. Well-equipped labs, featuring state-of-the-art anthropometric and metabolic equipment, are an important part of the educational experience, too, he added. The department has one of only a few BodPods available in the area. These egg-shaped, futuristic-looking machines are used by hospitals and professional sports organizations like the NFL to measure body composition. Students also gain expertise in using a metabolic cart, which continuously tracks cardiac, pulmonary and respiratory functions, as well as with a cycle ergometer, which is used to evaluate anaerobic fitness. This equipment along with other devices allow students to measure a variety of fitness indicators, providing valuable data they can use to plan detailed exercise programs — a skill highly sought after by potential employers. Nic Albarran, a sport performance major from Yorkville, spent 15 weeks during his senior year as an intern with AU’s strength and conditioning program, during which he assisted in a research project comparing conventional strength training with velocity-based strength training. The first is concerned with the amount of weight an athlete can move; the second with how fast he or she can move it. Upon graduation, Albarran intends to obtain his certificate as a strength and conditioning specialist and later a certificate in tactical strength and conditioning or TSAC. TSAC trainers help develop training programs for military personnel, police, firefighters, first responders and others that are relevant to the demands of their jobs.